We don’t take every case. Because we limit ourselves to a few key practice areas, we are able to bring experience and commitment to your particular case. Learn more about our approach to car and truck crashes, drunk and drugged driving crashes, wrongful death, and childcare negligence cases. Every time we get in a car and head out on the road, we are relying on other drivers to follow the rules and drive safely. When they don’t, our lives and the lives of our family members are put in danger. This is especially true of tractor-trailer drivers. When truck drivers speed, handle their rigs recklessly, or are simply unqualified to drive a semi, the results can be devastating. Many of us have seen the horrific aftermath of semi-truck crashes on Texas highways, and some of us have even been victims of such tragedies. At the Button Law Firm, we are committed to getting unsafe trucks off the road and recovering compensation for injured victims. Whether a truck crash is the fault of a negligent driver or an irresponsible trucking company—or both, we will hold the responsible parties accountable for their actions so our clients can be compensated for their injuries and dangerous trucks are taken off our roads. When a person chooses to get behind the wheel after drinking alcohol or taking drugs, he is risking the lives of the passengers in his car as well as anyone else who may cross his path. If you are the victim of such a negligent driver, you can take action to make sure he is held accountable. You are entitled to financial compensation for your injuries and other losses and the impaired driver should be made to pay. Unfortunately, even if the drunk driver is charged at the scene of the crash, he can still hire a defense attorney and attempt to get out of the charge. Claims of faulty sobriety tests and violation of legal rights have freed far too many drunk drivers in Texas. Because of this, you need someone on your side to ensure that you are adequately compensated, no matter what the legal outcome is for the drunk driver. The Button Law Firm has helped many victims of impaired drivers in Texas, and we can help you too. Any sudden death of a loved one is a tragedy, but when that death was caused by the negligence or intentional harmful act of another person, it can be particularly difficult to come to terms with. When a person is killed in a car crash or in a workplace accident, the surviving family members may be able to file a wrongful death lawsuit against the at-fault party to recover damages for medical care, funeral expenses, and loss of income. Wrongful death claims are a way for grieving loved ones to hold the guilty party responsible for the harm he or she has caused. At the Button Law Firm, we approach wrongful death claims with care and compassion. We are dedicated to getting you the justice you deserve and holding dangerous or irresponsible people accountable for their actions so that they do not harm another person. Contact us today to find out if you have cause for a wrongful death claim. An estimated 26% of children participate in a child care based program on a day to day basis while their parents are at work. This 26% deserve the best care and the best standards, because any time you leave your kids with someone else, you are trusting them with your child’s life. When your child is injured while in someone else’s care, that trust is shattered. If you are ever going to be able to trust another person to care for your child again, you are going to have to take action to hold the negligent daycare facility responsible for the harm that was done to your child. 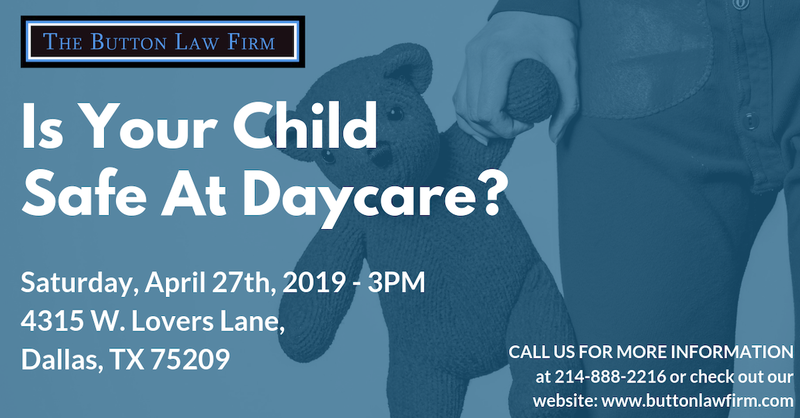 At the Button Law Firm, we are proud to represent families whose child has been injured either intentionally or by neglect in a Texas child care center. Injuries in daycare settings are often caused by inadequate staffing or unqualified workers. If your child is hurt, we will investigate the cause and determine if the facility was as safe as it should have been. If we determine that the center and its employees caused your child’s injuries, we will hold them accountable and do our best to get you the compensation you deserve for your child’s suffering.